HOUSTON COUNTY – The Crockett Economic and Industrial Development Corporation (CEIDC) has been in negotiations with an unknown entity for several months about the possibility of locating a new automobile dealership in Crockett. 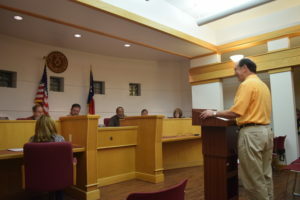 A buzz about the possibility of a new business locating in Houston County began to spread and with it came to questions. The first question was: would the negotiations be successful? The second question was: if the negotiations are successful, what type of automobile dealership would it be? A search of the Texas Secretary of State’s website revealed J. Davis Real Estate – Crockett is managed by James H. Davis, Jr. and was formed on Aug. 16, 2016 with the Certificate of Formation filed with the Secretary of State’s office on Aug. 17, 2016. A records search further revealed the address of 7250 Gulf Freeway in Houston is also the address of Gulfgate Dodge Chrysler Jeep. The President of Gulfgate Dodge is listed as James H. Davis Jr. on a Texas Fr anchise Tax Public Information Report. A phone call was placed to Gulfgate Dodge in the hope of speaking with Davis. Joan Sikes, the Secretary Treasurer of the J. Davis Automotive Group, indicated Davis was not in the office and was currently in transit to the East Texas area. Sikes was asked if perhaps she could shed some light on what type of dealership was being discussed for the Crockett area. While she was unable to provide specifics she did confirm the new business would be a part of the Dodge family of dealerships. It appears the answer to the second question about the brand of dealerships has also been answered and the answer is Dodge. Next articleCould Bigfoot Survive Out Here?